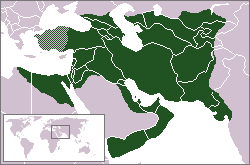 Sassanid Empire at its greatest extent. ca. 610 CE. The shaded area ( Phrygia/ Lydia) indicates vassal kingdoms under Sassanid military control.